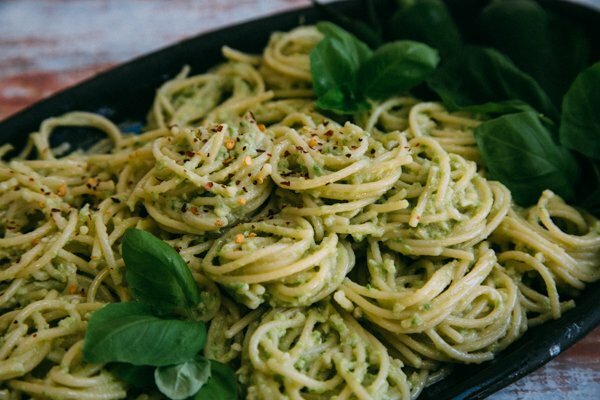 I’ve been wanting to try this jalapeño pesto spaghetti for SUCH a long time. You guys already know I love all things green like jalapeños and scallions and cilantro but I wanted this pesto to be a little simpler so I stuck to just jalapeños! 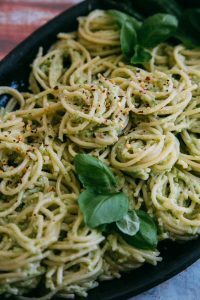 The almonds give the pasta a great nutty flavor and a crumbly texture which I loved (so don’t be alarmed if your pesto isn’t completely pureed)! I went heavy on the pecorino romano cheese in this recipe and really piled it on because it melts beautifully with the starchy pasta water and imparts a great saltiness into the dish. So please taste for salt AFTER you add all the cheese! I use thin spaghetti for this instead of regular spaghetti but I think some bow tie would be fantastic too! 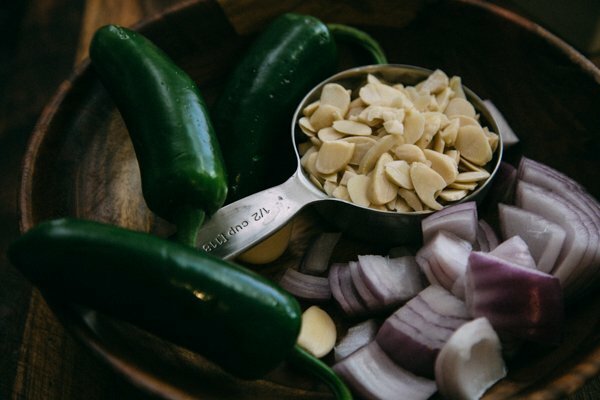 If you want more heat, throw in some serrano chilis or the tiny green ones that add a real kick! Hope you guys enjoy this recipe! It actually tastes great cold too! Cook pasta according to package directions (leaving it slight undercooked). Reserve 1 cup of pasta water just before draining pasta and set aside. 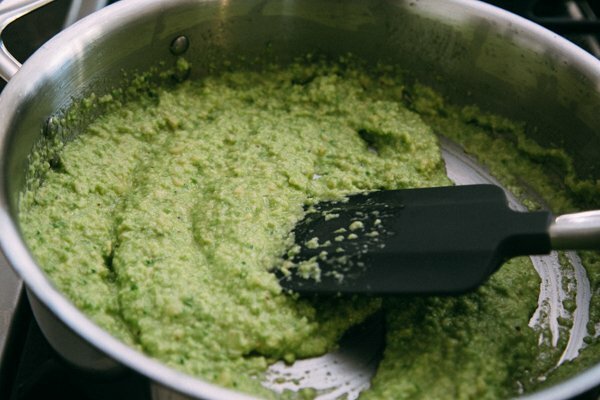 To make the pesto, combine the first 5 ingredients listed under the pesto recipe, in a food processor. Close the lid and slowly add in the olive oil in a steady drizzle while the food processor is on. Set Aside. In a large skillet, at the same time, add butter, olive oil and sliced garlic over medium heat. Do not let garlic brown, but let it soften. When garlic is fragrant, add the pesto to the skillet and stir for a few minutes. Add in the drained pasta, combine well. Add cheese and pasta water in little bits until you get a nice creamy consistency.